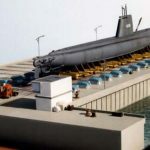 Submarine – SMARTT: Scale Models, Arts, & Technologies, inc.
A diorama can be that unique one-of-a-kind gift to celebrate years of service, cherished memories, or a particular milestone in one’s life. This diorama was presented as a retirement gift to an executive of Rolls Royce Corporation’s Synchrolift Division. It depicts one of their dry-dock units that is capable of lifting a full sized ship out of the water and trucking it away for maintenance and repair on special rail-cars.